After my Labor Day weekend scouting trip, I am able to start breaking the Lake Huron shore area down into smaller, more manageable segments, and I am starting with the Presque Isle area, even though it is more or less in the middle of the total area that I am planning going for extended stays . Why you may ask? Because there are so many things to see and do in a rather small area. Historic lighthouses, miles of coastal marshes to hike, and many places to kayak, just for starters. I am going to start with a map of the area that you can click on for a larger view. There are two lighthouses, the old and new Presque Isle Lights, Thompson’s Harbor State Park, the Besser Natural area, and Grand Lake, all close together, and all are places that I want to visit, either again, or for the first time. I see I left out Lake Huron itself, what a major oversight! I think I could easily spend most, if not all of a week in that one area, there’s that much to do. If I were rich, and had a large enough boat, I would put in at the harbor at Presque Isle and stay on the boat at night and get around by bicycle. The area is ideal for that type of trip, the problem is, I am neither rich, nor do I have a boat, other than a kayak and canoe. The only camping in the area is at the two cabins in Thompson’s Harbor State Park, and at $65 a night, I’d be better off in a motel, if I can find one. While there is quite a bit of residential development in the area, especially between Grand Lake and Lake Huron, there aren’t any places to stay or eat at from what I have found so far. There are a couple of resorts, but they are geared towards families and groups, not the solo traveller that I am. I may end up staying in either Rogers City, or camping at the Ocqueoc State Forest Campground and driving a few miles every day. I’ll start with the two historic Lighthouses. The Old Presque Isle light is one of the oldest still standing on the Great Lakes. 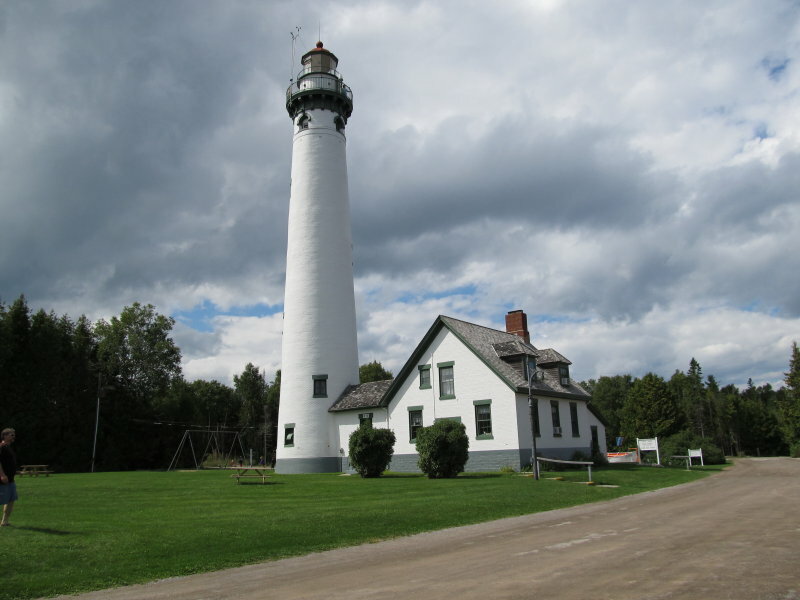 Then there is the New Presque Isle light, that is the tallest lighthouse on Lake Huron. Here are a couple of links to more information on the old light. And three for the new light. The two lighthouses are only a mile apart, you could easily bike, or even walk from one to the other. Both are in small parks, the new light has a larger park, nearly 100 acres, with a couple of places for a picnic lunch and two access points to Lake Huron for walking the beach, possibly for kayak access, and nature trails as well. Both have museums, I am going to plan on it taking one full day to take in everything the two have to offer. The lights are also within easy biking or walking distance of the marina at Presque Isle Harbor, it’s half a mile from the marina to the old light. This place really piqued my interest as I drove past it to get to the lighthouses. Situated along seven and a half miles of Lake Huron shoreline, this undeveloped park provides a rustic retreat for hikers exploring the park’s six miles of trails. In addition to the developed trails, there is also a system of old roads that have been closed to vehicles by the DNR that you are free to hike as well. The only camping at Thompson’s Harbor is 2 rustic cabins, at $65 a night, too steep for me. Here are links to the unit map, and a map of the trails. If you look at either my map at the top of this post, or the unit map, you can see that the outlet for Grand Lake flows through the park, with a couple of small lakes on the drain. I don’t know if you can get a kayak down the drain 😉 but I am probably going to find out! Most of the area looked to be marshland, don’t let that fool you. Coastal marshes along the Great Lakes are not typically the boggy, sink in the mud to your hip type of marsh that you think of when you hear the word marsh. Coastal marshes on the Great Lakes are normally very firm and easy to walk, and filled with wildflowers and wading birds during the late spring, summer, and early fall. I can see spending two days at Thompson’s Harbor State Park, one walking the trails, and another entire day of beach combing the Lake Huron shoreline. There could even be a third day, or most of a day, kayaking the outlet of Grand Lake to Lake Huron and/or kayaking the coast of Lake Huron there. 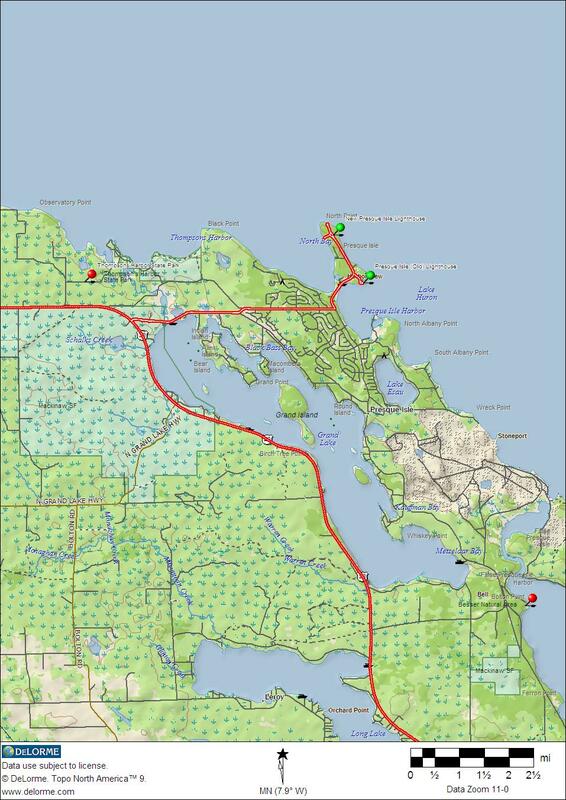 The state park is also within easy bike distance of the two lighthouses and the marina. Contains a stand of mature, virgin red and white pine with spruce, balsam, cedar and birch. Includes over 4,000 feet of Lake Huron shoreline composed primarily of limestone gravel shore. Provides habitat for plant species of special concern, including the Pitcher’s thistle, a plant threatened with extinction. There are also remnants of the old logging town of Bell, Michigan, which has long been abandoned. I found this photo blog from Dan Weemhoff from when he hiked the area in February of 2009. This place was on the list before I found Dan’s blog, now it is a must see! Even though the developed trail is only a little over a mile long, I am going to plan on half of a day for this. There are parts of buildings till standing, stands of virgin pines, and the Lake Huron coast as well as the trail. I won’t say they are endless, but there are many, with lots of good access sites. First, there are miles of Lake Huron Coastline to paddle, over 7 miles along Thompson’s Harbor State Park alone. The area has many bays and points, so the weather won’t be as much of an issue as in other places. 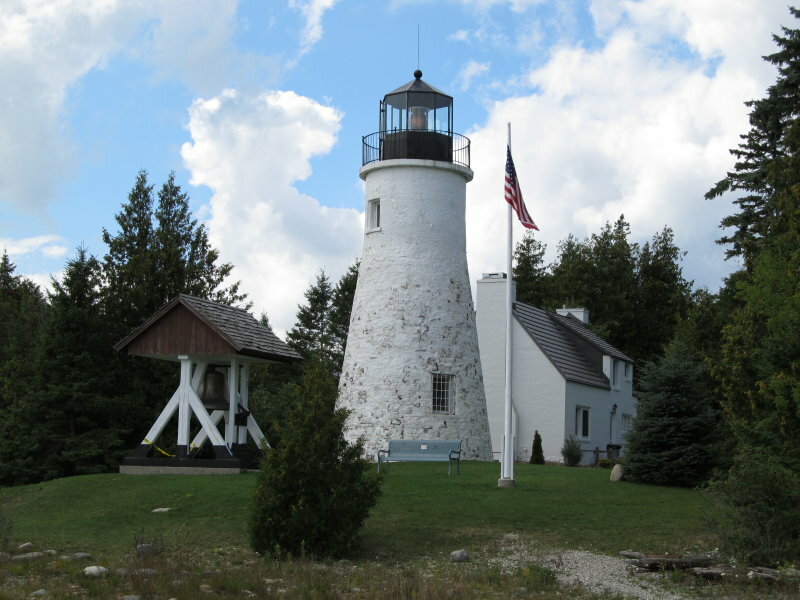 There’s good access at the state-run marina on E County Road 638, and at two places in the park where the new Presque Isle Lighthouse is located. I may put in at the Rockport boat ramp, paddle up the Lake Huron coast past the Besser Natural Area, and up the Bell River, which isn’t a river at all. If the wind does kick up, then there’s Grand Lake, also with many access sites. Grand Lake is very large with many bays, and peppered with islands. It looks like a fantastic still water paddling spot to me. There is access at Fletcher-Gilcrest Park to start with that’s just a short distance away from the marina and also on E County Road 638. That’s at the north end of Grand Lake where the outlet flows towards Lake Huron. There is a developed boat ramp a few miles south on US 23 that you can’t miss, and at least two roadside parks/picnic areas along US 23 that would double as kayak access. There is another developed boat ramp on the southeast side of Grand Lake. I have a feeling that once I paddle this area, I will find that it is equal to many more popular destinations, like the Les Cheneaux Islands. As I write this in September of 2011, I am thinking of foregoing my yearly trout trip to the Pigeon River Country and spending my one week vacation in this area towards the end of May. The lighthouse museums will be open then, the wildflowers will be in bloom, and the wading birds and other waterfowl will be in their finest feather. All birds for that matter. Thanks for taking the time to read and comment! You’re very wise in choosing that area to live in, I love it there. I’ve spent the majority of my vacation time there the last three years, but I’ll have to miss this year.